A man was wounded but expected to survive following a car-to-car shooting in Hacienda Heights Sunday afternoon, officials said. The victim, a 21-year-old man, was stopped at a red light on Lujon Street at Hacienda Boulevard in a 2004 Audi when the attacker pulled up in an older-model, white pickup truck, Los Angeles County sheriff’s Sgt. Rick Thurlo said. “(The shooter) pulled up next to him on the right side and fired into the victim’s vehicle, striking him once in the upper right shoulder,” Thurlo said. A rifle was believed to have been used in the shooting. Thurlo said the wounded man drove north a short distance to Hacienda Boulevard and Gale Avenue, where deputies encountered him. Officials initially described the shooter only as male. He was last seen driving south on Hacienda Boulevard from the shooting scene. The motive in the shooting was not clear. Puente Hills Concerts in the Park will celebrate its 20th anniversary beginning July 1 with the big band sound of Manny Glass Band. The orchestra will kick-off the concert in the park series by playing patriotic music to celebrate the Fourth of July. They are known for playing popular tunes from the 40s big band era. Summer concerts will be held 7-9 p.m. Tuesday nights until Aug. 12 at Peter F. Schabarum Regional Park, 17250 E. Colima Road, Rowland Heights. Admission and parking are free. Food, beverages and desserts are available. This summer will showcase an extraordinary talent of musicians, bands and entertainers. Supported by Los Angeles County Parks and Recreation Department and Supervisor Don Knabe, Concerts in the Park is a great way to spend your Tuesday evenings with family, friends and community. July 8: Mariachi Reyna de Los Angeles, America’s first all-female mariachi ensemble, which brings sensitivity, beauty, warmth and an attractive perspective to the realm of Mexico’s musical heritage. July 15: Hot August Night with Dean Colley, a Neil Diamond tribute band. July 22: Vaud and the Villains, a 19-piece 1930s New Orleans orchestra and cabaret, at once seedy and inspiring, gritty and sublime. July 29: Beatles vs. Stones — A Musical Shootout. The British Invasion brought us the two most popular rock groups of all time, the Beatles and the Rolling Stones, as well as the liveliest debate in rock history — which band is the greatest? These two legendary bands will engage in a musical “shoot out of the hits” featuring internationally renowned tribute bands, Abbey Road and Jumping Jack Flash. Six alternating power sets with the two bands coming together on stage for an amazing encore makes this show a once-in-a-lifetime event. Aug. 5: Cold Duck. In 1969, trumpet player/vocalist Jose Cuadra assembled a group of musicians to form an eight-piece band known today as Cold Duck, considered Southern California’s premier dance band. Aug. 12: Three Mo’ Tenors is an extraordinary musical event, featuring 10 styles of music from opera, to jazz, to Broadway and more. For more information on concert dates, times and park hours, visit www.concertsinthepark.com or call the Schabarum park office at 626-854-5560. The Habitat Authority is dedicated to the acquisition, restoration, and management of open space in the Puente Hills for preservation of the land in perpetuity, with the primary purpose to protect the biological diversity. Additionally, the agency will endeavor to provide opportunities for outdoor education and low-impact recreation. -Volunteer Docent Naturalist are needed to lead and assist with hikes given to the public and school groups. We are looking for people who have a passion for nature and enjoy working both with children and adults. -Volunteer Role & Responsibilities: Trained trail guides will assist with leading group of families or school kids and answer any questions along the way. -Requirements: Training/orientation as well as a background check are required. -Benefits: Volunteers will be able to educate the public on environmental preservation, have fun in the outdoors and get some exercise too! -Call to action: Visit Habitat Authority http://www.habitatauthority.org/waystohelp to complete a volunteer application. After days of uncertainty, Haitham A. of Granada Hills was overwhelmed with relief and joy after his sister contacted him on Skype Thursday to tell him she made it out of their native Iraq to escape the bloodshed. In recent years, Haitham’s relatives in the war-torn Arab country have endured the constant threat of bombings and kidnappings as well as wearisome security checkpoints. A fresh round of sectarian violence prompted his sister’s family to flee Baghdad for Jordan while his brother’s family has fled to Iraq’s calmer northern region of Kurdistan until escalating tensions subside. With the Islamic holy month of Ramadan starting Saturday night, Haitham and other Southern California Muslims with ties to countries engulfed in turmoil say they will keep their endangered relatives in their thoughts, prayers and actions. During Ramadan, observant Muslims around the globe abstain from food, drink and sexual relations during daytime hours to commemorate the month in which the Quran was said to be revealed to the Prophet Muhammad. “We appeal to God Almighty to make it easier for them because many of them are also fasting in Iraq, but fasting knowing they are unsafe,” said Haitham, who came to the United States in 1982 and has a civil engineering degree from Cal State Long Beach. Read more in Brenda Gazzar’s story RAMADAN. Los Angeles County Fire Chief Daryl Osby will join Forest Service, CAL FIRE, and other agencies to discuss the upcoming fire season on Monday at the Diamond Bar Center. Fire officials will discuss the outlook for the 2014 season, as well as the impact the drought is having on firefighting. A display of regional firefighting resources will be on hand, including specialty wildland equipment. We’ll share what we learn online Monday and in Tuesday’s San Gabriel Valley Tribune. Diamond Bar teens are invited to the city’s annual Teen Night Out event from 7 to 10 p.m. July 18. Planned by the teen group “DB4Youth In Action,” the event will be held in Sycamore Canyon Park at 22930 Golden Springs Drive. Teens can dance to Top 40 dance and pop hits. A variety of activities will include air tag, a human sphere ball and other inflatable games. Admission is free for youth ages 13 to 19. Snacks, beverages, keepsake photographs and glow-in-the-dark items may be bought, with proceeds benefiting future activities by DB4Youth In Action. For more information, call Alison Meyers at 909-839-7062. The Hsi Lai Buddhist Temple is celebrating its 25th anniversary in Hacienda Heights. One of the largest Buddhist monasteries in the Western hemisphere, the local temple is holding a yearlong celebration with special events and activities. Over the weekend, the Hsi Lai Temple held its first music and art festival. Organizers lined up more than a dozen bands and artists for the family event. The event was held in the temple courtyard at 3456 Glenmark Drive. The traditional Chinese mountain monastery is built adjacents to Hacienda Boulevard in the Puente Hills. It is the American headquarters for one of Taiwan’s largest Buddhist organizations, Fo Guang Shan. Check out the photos from the fun event. Volunteers from Verizon FiOS created a trench in Walnut home build. On Saturday, Verizon FiOS Southern California donated $2,500 to the Pomona Valley branch of Habitat for Humanity to help address the critical issue of essential, basic housing for U.S. Veterans and their families as part of the “Salute to Service” Veterans Build Program. Local Verizon employees volunteered their time last year towards a home build in Walnut. This year, volunteers installed solar panels and retaining walls, created a trench for the underground pipe and cleared brush for future projects. The FiOS SoCal Campaign supports local causes, sharing its success with the communities where its employees live and work. Verizon believes in making a positive impact on the communities it serves. The Pomona Valley Habitat for Humanity “Salute to Service” Veteran’s Build Program is dedicated to building new, sustainable homes for United States Veteran families in the Pomona Valley area. 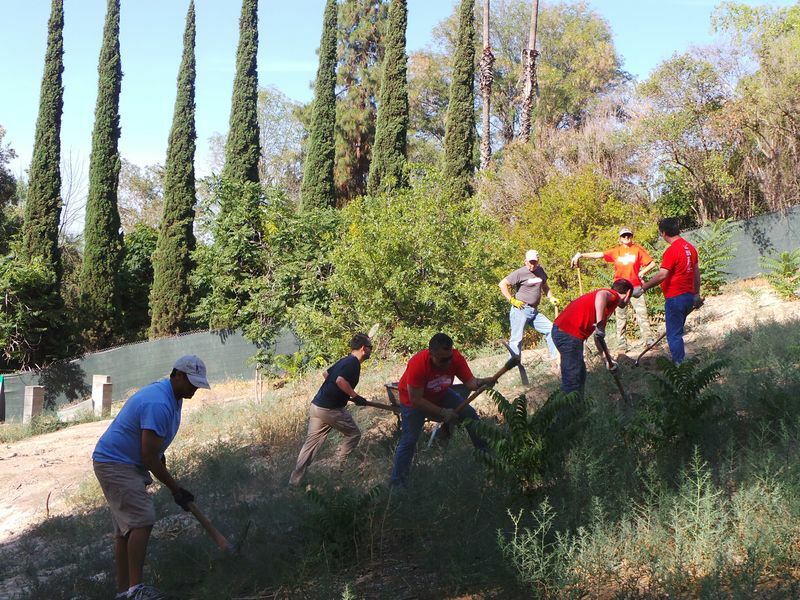 To learn more about Verizon FiOS’ SoCal community involvement, visit www.FiOSSoCal.com. Pomona Valley Habitat for Humanity breaks ground in Walnut for new veteran home. 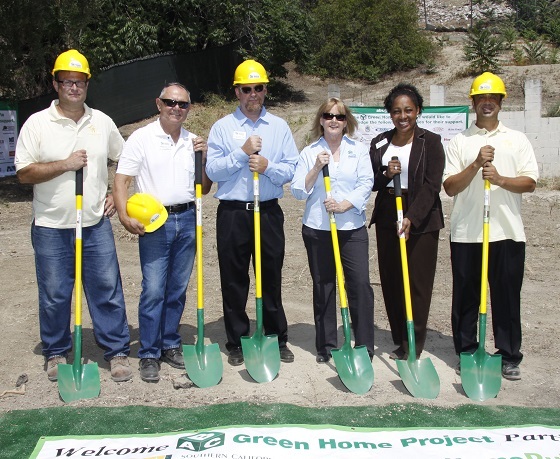 On June 11, Pomona Valley Habitat broke ground for their next project in Walnut in partnership with PV Habitat and Peninsula Publishing, Southern California Edison and the City of Walnut. “I can honestly say that these many months of planning have been quite a learning experience for our small Habitat affiliate” said Jody Gmeiner, President and CEO of Pomona Valley Habitat for Humanity. “All three groups joined forces to break ground on this, our first home for a military or veteran family”. This project, known as ABC 2.0 (meaning the house will be Affordable, Buildable and Certifiable with all green agencies) is a Net Zero house; it will produce the energy it needs, thereby helping the family keep their energy costs very low. The Walnut house will not be a typical Habitat house, but PV Habitat did not want to pass on this extensive learning experience in green building, as well as the opportunity to serve another family. Interested Veterans should call Pomona Valley Habitat for Humanity at (909) 596-7098 to be placed on an orientation waiting list. Veteran families currently living in the Pomona Valley Habitat service area are eligible to apply. Pomona Valley Habitat serves the local cities of, Chino, Chino Hills, Claremont, Covina, Diamond Bar, Glendora, La Puente, La Verne, Montclair, Ontario, Pomona, Rancho Cucamonga, San Dimas, Upland, Walnut and West Covina. Please note, for the Walnut and La Verne houses, eligible Veterans living in those cities will be given first consideration. If we are not able to find eligible Veteran families currently living in the cities of Walnut and La Verne, those two houses will also be available for Veterans living in our entire 16 city service area. For more information on how you can be involved or support this project, please call our office at 909-596-7098.